Cast: Lee Dong Gun, Jo Yoon Hee, Cha In Pyo, Choi Won Young, Hyun Woo, Shin Goo, Kim Young Ae and Oh Hyun Kyung. 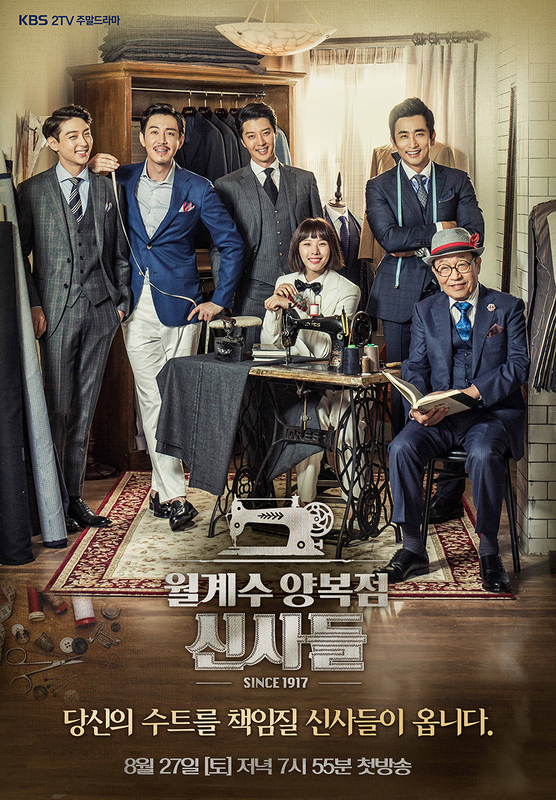 This drama follows four men, who get affiliated with a small tailor shop called “Wolgyesu Tailor Shop”. Lee Man Sool (Shin Goo) is the second-generation owner of the Wolgyesu Tailor Shop. After being unable to get anyone to take over the shop, he decides to leave his family, leaving them with a letter. His son Lee Dong Jin (Lee Dong Gun) is wealthy manager in a clothing company owned by his wife’s diseased father. Due to internal conflict he is outed of the company and returns home. Here he meets Na Yeon Sil (Jo Yoon Hee), a seamstress that was supposed to get married, but her fiancé was arrested on the wedding day. Due to the vacancy of a tailor in the shop, Bae Sam Do (Cha In Pyo) a former pupil of Man Sool, finally manages to persuade his aggressive wife Bok Sun Nyeo (Ra Mi Ran) to close down their chicken shop, to start living in the Lee household. At the same time Lee Dong Sook (Oh Hyun Kyung), the daughter of Man Sool and sister of Dong Jin, persuades their mother to let her first crush and forgotten singer Sung Tae Young (Choi Won Young) live in the house, only to create even more havoc. Kang Tae Yang (Hyun Woo) is the youngest of four, who is the childhood friend of Yeon Sil. After getting dumped by his longtime girlfriend for a rich CEO, Tae Yang decides to join the company - which happens to be the company Dong Jin was fired from. I remember reading about this drama long before it came out, and I was more than excited to watch it because of two of the leads, Cha In Pyo and Lee Dong Gun. Besides the fact that they are great actors, I have never seen them act together in a movie or drama - which made it even more exciting. Unfortunately, I felt quite confused in the beginning, because of the huge number of plots entwined in the main plot - making me forget not only names, but also the relationships between the characters, both kinship and other. This made me forget about the two leads, as I tried to wrap my head around it, and when I finally figured it out, they all kind of became less ‘famous actors’, and more their characters. The story and screenplay were great, even though I felt the acting could’ve been a bit better, I was satisfied with the overall. So, all in all, it is a good family drama that made me laugh, and happy.